Here is history you can download. As we print more, we'll be posting more. 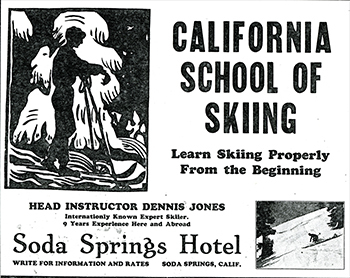 Meanwhile are newsletters are a great source of stories and pictures about Donner Summit history. We have compiled indices of the stories and pictures to make it easy for you to peruse. The Ice in Ice Lakes - a booklet about the Summit Ice Co.: Who, when, where, etc. Camping in the Sierra - an 1873 account of a trip to Donner Summit to go camping. They visit Summit Valley, Soda Springs, and Tinkers Knob. They see a grizzly, discover gold and enjoy the magnificence of the Sierra Summit. Hiking the Three Donner Passes by Marshall Fey, eminent Emigrant Trail historian. Now that you've perused the above, you should know the really best source of stories is the almost 100 editions of the Heirloom. Each is full of Donner Summit history stories and old photographs. Take a look at the article and picture indices on each Heirloom page. The annual Heirloom pages also list all the stories in each monthly Heirloom. Then you might like to subsribe - for free. You'll see links. Walking Through Donner Summit History is a book covering ten walks and all the history stories that go with them. "To deal with the snow the workers dug snow tunnels through which they traveled to and from work. The tunnels ranged from fifty to 200 feet long and included excavated rooms. There were windows dug in the sides of some so that the tunnel debris could be thrown out. The tunnels had to be continually maintained because the snow roofs would sag. So the workers were not just excavating the rock they were also continually digging the snow and sometimes the snow fell faster than it could be removed." Below, it was not always easy to get over Donner Summit. 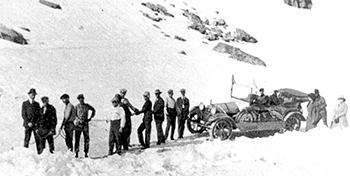 This a about 1915, long before 1932 when the road over the summit was cleared of snow. See our exhibits page for more "It Was Not Always Easy to Get Over Donner Summit."